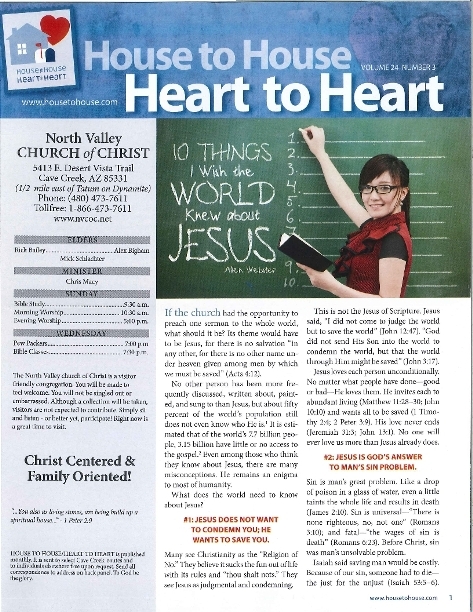 Welcome to the North Valley church of Christ here in Cave Creek, Arizona! If you live nearby or you are traveling in our area, please be sure to visit us for worship and Bible study anytime. We love to have guests! Our members are very friendly and inviting, yet we will not make you uncomfortable when you attend. You'll find a variety of people who together are trying to live and love according to God's true Word. There are classes for all age groups, and we worship twice on Sundays. Our schedule is listed below. Our goal is to help people know and obey Christ, so that they along with us, may grow into the "stature of the fullness of Christ." Please let us shake your hand and introduce ourselves, while we help you find a seat. We will participate in communion, sing a'cappella without instrumentation, listen to a sermon by our preacher, offer several prayers and our members will give of their means. Please feel free to just pass the basket to the next person as we never expect our guests to participate in giving. We look so forward to meeting you and your family very soon. The HTHHTH publication is a local mailing. If you would like to see this issue or any past issues please click this link.